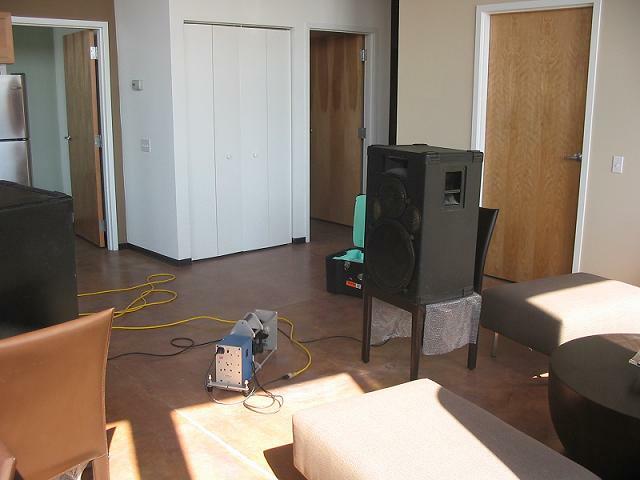 Loft retrofit projects often have major sound isolation issues because older buildings not originally designed for residential use often do not have the requisite robust partitions between spaces. Often, the floors between units do not have enough mass and decoupling for proper impact and sound isolation. David Coate Consulting was hired to design and recommend necessary floor treatments for the Granite Lofts Project located in Quincy, Massachusetts. DCC designed a floating floor isolation system using Kinetics products. The Uniform Building Code requires an STC and IIC (Impact Isolation Classification) of 50 (45 if field-tested). Structural limitations in this building limited the extent of possible treatments, and as a result, it was uncertain whether or not the floor isolation system would meet the UBC values. After the design was complete, DCC conducted impact isolation testing as well as noise level reduction measurements on a test section of the building. The test section was installed during the construction phase. The model unit floating slab construction tested at STC 52, which exceeds the UBC Code requirement. 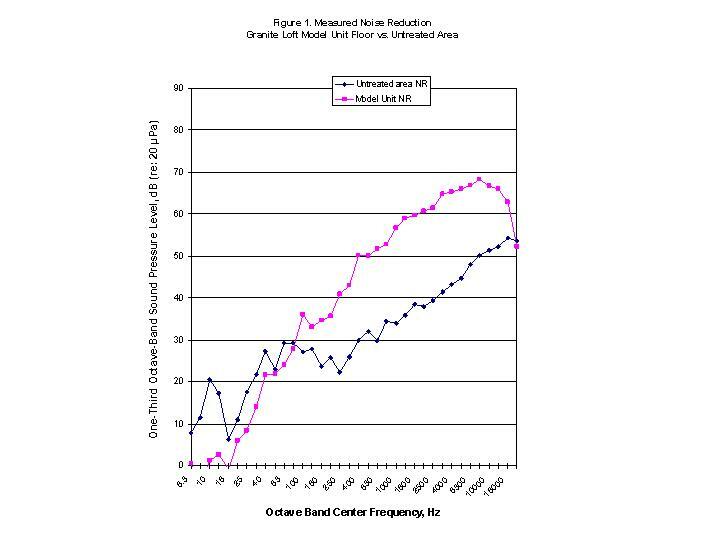 Figure 1 shows the measured Noise Reduction (NR) in 1/3 octave bands for both treated and untreated conditions. This Figure shows a large improvement in NR over existing conditions. The low frequency data in the untreated measurements is likely not valid; it was probably influenced by a passing vehicle or some other low-frequency noise source. I conducted impact isolation testing in accordance with "Standard Test Method for Field Measurement of Tapping Machine Impact Sound Transmission through Floor-Ceiling Assemblies and Associated Support Structures" (ASTM E 1007-04). 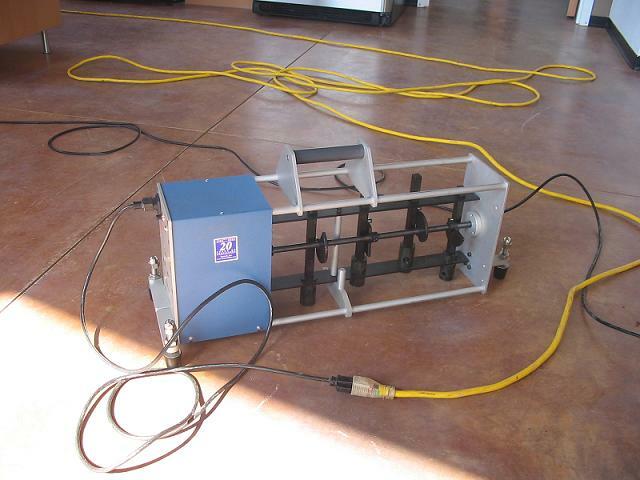 Figure 2 shows the tapping machine employed for this test. A total of 16 1/3 octave band spectra are required, each associated with four different tapping machine positions and four microphone positions in the receiving room. In addition, the procedure calls for measurement of the RT60, the reverberation time of the receiving room (in this case, the garage) to normalize the results to a standardized room absorption. The model unit tested out at FIIC 39, which is less than the UBC Code requirement of FIIC 45 or greater. The untreated area tested at FIIC 23 which indicates that a considerable improvement has been made by the addition of the floating slab. These test results are important at this time in the construction process, because the results could be used to alter our sound isolation treatments. For the section of the building with the planned floating slab, airborne sound should not be a problem since the measured STC is greater than that required by the UBC Code. Impact sound could be a problem since the FIIC is less than what Code requires. However, the results are 6 dB lower than the requirement which is a moderate, and not a large difference in terms of decibels. For comparison sakes, a 10 dBA change in sound level is generally perceived as a doubling of loudness; a 3 dBA change is barely noticeable. These sound level perception guidelines do not exactly compare with single number IIC ratings, but they are reasonably comparable. A rather simple mitigation scheme to improve the IIC would be to add carpet. Carpet can help reduce high frequency impact sound. The thicker the carpet and pad, the better the performance. Concerning the portion of the project that will have a floating Kinetics system, but no concrete, these tests indicate that there could be significant sound and impact isolation issues. For these sections, either a floating concrete floor would be required, or some type of suspended ceiling treatment such as GWB to achieve STC and IIC values comparable to the UBC Code requirement.